Help, I’m going bald, what can I do? I was blessed with beautiful long golden mohair, the envy of many a teddy. But I have noticed, for some time now, that it is thinning. 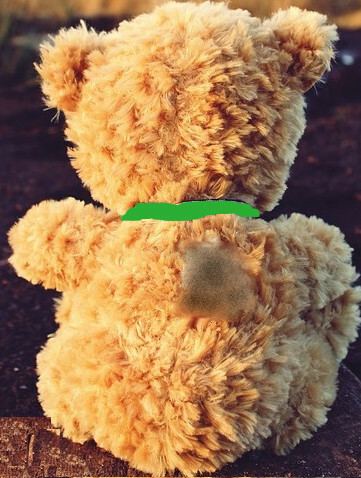 I have tried denial, it worked for a while, but last week my owner had me valued by a horrid, grotty little man with sweaty hands and bad breath and I overheard him mumble that the large bald patch on the bear’s back has decreased it’s value. I’m in denial no more but I’m losing fur fast with the worry. How can I hold my head up in the company of the bears that envy me? I don’t want to be a bald victim of ridicule, whispers behind my balding back as though I have brought shame on the teddy bear race. It’s not so bad for the plain teddies; they have nothing to lose by going bald. I will have lost it all, the respect, the admiration the attention of girl teddies, why me? I’m sorry to hear you’re losing your fur, honest. This is a worrying event for us all, I know from experience. But hang on a minuet, what’s this you say about it not being so bad for plain teddies? How bear you! I’d say your attitude is more unbearable to the teddy bear race than having to bear your bald patches. I have lots of letters from teddies that consider themselves plain or ugly, that believe that one-day; they will have fur as beautiful as yours must be. But then their bubbles are burst as they start to loose the fur they believe plain, and totally are distraught to see it not be replaced by beautiful fur, but by baldness. They have lost more, their fur and their hopes. So Balding Bearnard, never say plain bears have nothing to lose. In answer to your question “What should I do?” Have you tried pulling long bits of fur over the bald patches and gelling them down? That’s what the humans do!